Beautiful and picturesque Topsail Island, North Carolina, with its 26 miles of windswept shorelines and blue-green Atlantic waters sets the scene for a picture-perfect destination wedding. The tranquil coastal beauty and relaxed ambiance of this Carolina island paradise are unmatched, and all of the professional wedding resources you need to plan your big day are right nearby both on-island and off. From wedding venues and accommodations to photographers and florists to wedding officiants and equipment rentals and more—we have it all. Let us help you make your destination wedding dream a very happy reality. This is one of the biggest days of your life, and you deserve the absolute best. Don't settle for less! Here's what you need to know when planning your Topsail Island destination wedding. When is high tide? You'll want to avoid the possibility of your ceremony being dampened by waves and to ensure there is enough beach to set everything up on. Be sure to check our local tide charts to see when low tide occurs on your special day. We highly recommend you plan your event as close as possible to the time of low tide. Please note: we cannot control the tides or Mother Nature. A back up plan is highly encouraged as average storms can changed the tides and beach structure. What's the forecast? If rain is predicted, you'll need a contingency plan. Make sure you have an indoor space to host your ceremony and reception in the event of bad weather. How noisy will our site be? Crashing waves, rustling breezes, and general beachgoer chit-chat can all add up to a pretty loud environment. Your sound system should be set up so that all your guests can hear your vows. How hot will it be, and is there any shade? Wild guess, but you're probably used to wearing a swimsuit on the beach. Now imagine being in a suit and tie, which is what your guy guests will likely be sporting… If there's no shaded area, consider giving out parasols can offer some protection from the sun. How crowded will the beach be? Again, a beach wedding isn't exactly private. If you really want to avoid the droves of summer bodies, consider an off-season wedding. Sand. Sand is a beach. Keep some towels and baby powder handy so you and your guests can dust off before the reception. 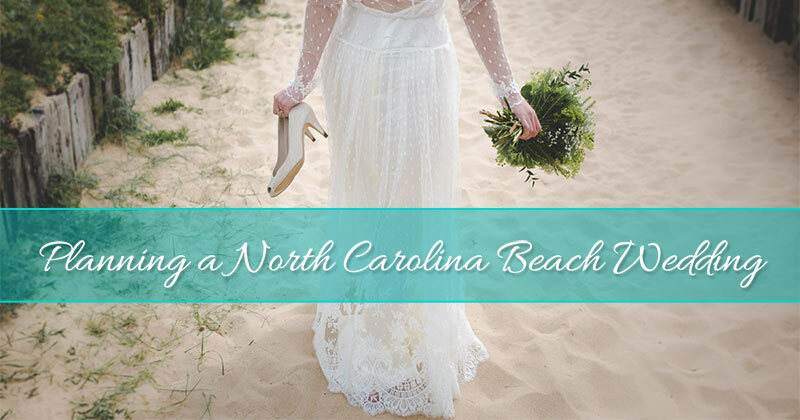 There's not a lot to do before you say "I do" in North Carolina. North Carolina law requires couples to obtain a marriage license prior to the wedding ceremony. Be sure to bring drivers’ licenses and Social Security cards for each person plus $60 in cash. No physical is required and there is no waiting period; the license is good immediately and is valid for 60 days. Soon-to-be brides and grooms ages 21 and above may apply for a marriage license online to save time in the Register of Deeds office, but they must come in to the Register of Deeds office within three days with licenses, Social Security cards and cash. NC Marriage Licenses in Onslow County: Licenses are available at the Onslow County Register of Deeds office at 109 Old Bridge St. in Jacksonville, NC. Appointments may be made by calling 910-347-3451. NC Marriage Licenses in Pender County: Licenses are available at the Pender County Register of Deeds office at 300 E. Fremont Street in Burgaw, NC. Contact them at 910-259-1225 for more information. Marriage ceremonies in North Carolina can be either religious or civil. A religious ceremony is performed by an ordained minister; a civil ceremony is conducted by a magistrate. Both civil and religious ceremonies require two witnesses. There is no need to stress about planning the details of your big day, particularly when you're planning a Topsail, NC destination wedding from afar. We have professional and experienced wedding planners in the area who can take charge of managing and orchestrating every detail of your wedding day to perfection with as little or as much involvement as you prefer. Getting Married in North Topsail Beach: A permit is not required to have a wedding on the public beach at North Topsail. If you do have a wedding on the beach, the Town of NTB asks that you leave the beach in the condition that you found it. Contact Kim Weaver at (910) 328-1349 if you would like to reserve the Town's gazebo or picnic shelter for your event (click here for the reservation form). Marriage licenses are issued through the Onslow County Register of Deeds. Topsail Manor: Newly constructed in late 2017, Topsail Manor is a grandiose, eight bedroom oceanfront manor that boasts luxurious amenities, spacious accommodations, and elegant coastal décor. Designed to accommodate large groups, Topsail Manor’s approximately 8,000 square feet provides the perfect venue for weddings, reunions, multi-family vacations, and corporate events. Getting Married in Surf City: If the wedding is held within the town limits of Surf City a permit is not required; however, please take note of the following helpful information when planning your wedding. Check with the Parks & Recreation Department at (910)328-4887 to see if anything else will be happening at the location that you would like to use and please contact the Police Department to make them aware of the event at (910)328-7711. You may have a shade tent and chairs; however, you may not mark off an area of the beach and not allow others since it is public property. Also be sure not to block off any public beach access. Glass, open flames, candles or tiki torches are not allowed on the beach. Please ensure that there is adequate parking for your guests and that no one parks on the sidewalk and bike path. If you are going to have a band, DJ or a loud radio system you need to obtain a noise permit from town hall. 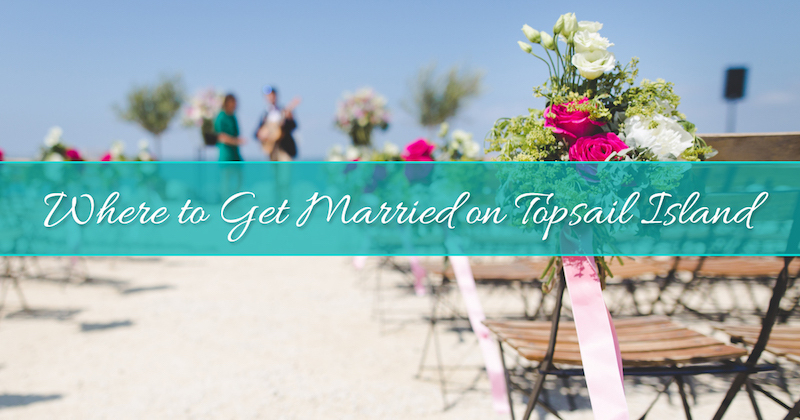 Getting Married in Topsail Beach: The Town of Topsail Beach welcomes anyone who would like to have a beach wedding. There is no charge and no permit is required unless you plan to use amplification equipment during your event, including ceremony and reception. Outdoor Entertainment Permits require approval by the Town Manager and the Chief of Police not less than one day in advance of the event date. During the tourist season, May through September, parking is limited. The wedding party and guests should be aware that the public's access to the beach cannot be restricted for the wedding, cars must be parked completely off all paved streets, and walking on or disturbing the dunes is not allowed. Please contact the Topsail Beach Police Department at (910)328-4851 and advise them of your event date, location, and contact information in case of an emergency. Do you want to get married where you have private access to the soundfront of Topsail Island? The unique and historic Assembly Building, with its beautiful island setting, is listed on the National Register of Historic Places and is located on the soundfront at Topsail Beach, NC. This historic building has a capacity of 250 people and provides a perfect setting for any occasion including bridal showers, wedding ceremonies, wedding receptions, and rehearsal dinners. 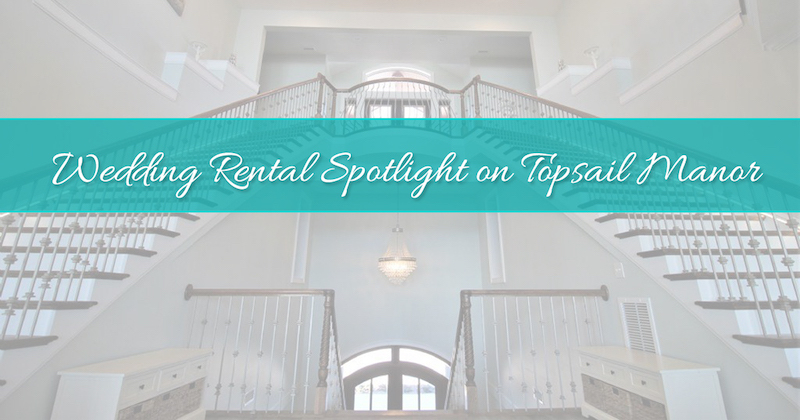 The Topsail Assembly Building offers a catering kitchen, dance floor, serving counters, banquet tables and chairs, handicap ramp with 3300 square feet of space in the Main Area plus an additional 286 square feet in the smaller Soundside Room. The best amenity here is the beautiful view of the Topsail Island sunset each and every night. You can read more about weddings at the historic Assembly Building in Topsail Beach here. Whether you are planning a wedding reception or rehearsal dinner or both, the North Shore Country Club provides the perfect venue. The beautiful clubhouse and golf club setting provides an exquisite backdrop for any event. Located adjacent to Topsail Island in nearby Sneads Ferry, NC, this venue is conveniently located for easy access. They are available to assist you in making all of the arrangements for your big day. Choose your own caterer or select from their professional list. Reception space is available for up to 150 guests and it's a perfect venue for seated parties up to 70 guests, offering a beautiful private dining area with reasonable facility rental rates and all ABC permits. They are willing to customize your reception to satisfy your wishes. You can read more about weddings at North Shore Country Club in Sneads Ferry here. At Ocean's Edge the ocean view is the just the beginning! They make your wedding day an unparalleled experience tailored to reflect your personal style. As the tallest point on Topsail Island, the panoramic view is unlike any other in North Carolina, setting the stage for the celebration of your dreams. Their creative layout allows for guests to enjoy the sunset as they dine on delicious food, sip creative cocktails and dance the night away. With multiple spaces to fit groups of 20-300, they have an option for almost every couple. As the only full service wedding venue on Topsail Island, you can let their team take care of the details. From linens to a rainy day plan, they have you covered. The onsite coordinator provides custom packages to help take the stress out of wedding planning allowing you and your guests to truly enjoy their experience on 'the Edge'. Think outside of the ballroom box and remember that your wedding should be as unique as your love story. You can read more about weddings at Ocean's Edge Restaurant and Event Center in North Topsail Beach here. Scenic and spectacular Soundside Park in Surf City, NC, allows for soon-to-be brides and grooms to get married in the fresh coastal air where soundside waters and brilliant Topsail sunsets are all part of the package. This beautiful park overlooking the Intracoastal Waterway has picnic shelters available by reservation and an amphitheater available for wedding ceremonies. Also for your enjoyment, there are boardwalks around the sound's edge, several viewing decks, and a fishing pier. For more information about weddings at Soundside Park, contact Surf City Parks & Recreation at (910) 328-4887. The Surfside Center located at the Surf City Welcome Center is an ideal setting for bridal showers, wedding receptions and rehearsal dinners with its oceanfront setting and convenient location right at the heart of the island. The venue offers 1,800 square feet of oceanfront meeting space plus an extra 650 square foot outside patio facing the ocean . The Surfside Center offers a long list of amenities with plenty of parking and access to the beach. Please note that the Surfside Center is not equipped with speakers or an audio system. You can read more about weddings at the Surfside Center at the Surf City Welcome Center here. The greater Topsail area has a wealth of wedding professionals for every detail of your wedding day. 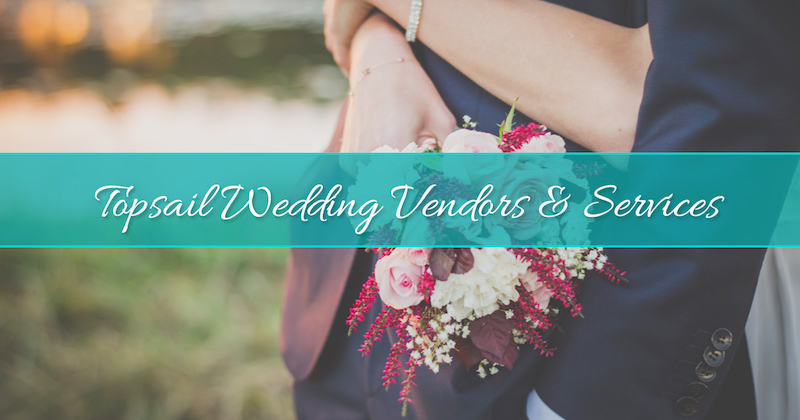 We have the local vendor recommendations and links to the information you need including our favorite bakeries, caterers, DJs, event equipment rentals, florists, photographers and videographers, plus salons and spas. Here at Access Realty we are happy to accommodate large groups and have the beautiful Topsail Island accommodations to do it. Your wedding party will feel right at home and be right nearby when you need them. We have several duplex properties in which we manage both sides and single family homes that are side-by-side and can accommodate up to 45 guests. We also have a number of condos, townhomes, and private homes within the same communities. We can help you explore your options and get everyone settled in and ready for your Topsail Island wedding. 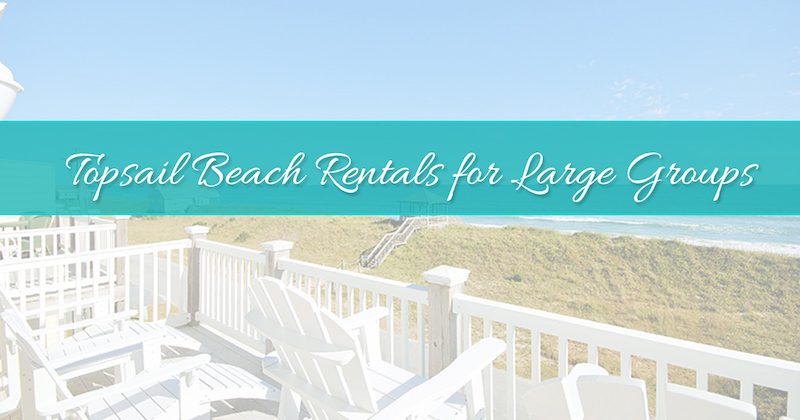 Take at look at Access Realty's Large Group Topsail Vacation Rentals to get started. We'd like to introduce you to this unique jewel of a rental that is a grand and luxurious option which can serve as both a wedding venue and accommodation for you and your wedding party guests. Topsail Manor is a newly constructed oceanfront rental boasting over 8,000 square feet of beautifully furnished beachfront bliss. With 8 bedrooms and 8 full baths, Topsail Manor comfortably sleeps up to 26 guests. Along with all that spaciousness, there is a long list of amazing amenities both inside and out. With two levels of expansive oceanfront decks, an outdoor kitchen, a pool and a hot tub, the outdoor amenities are spectacular and make entertaining a breeze. There is also a Tiki Bar down by the pool for serving up cold drinks and an oceanfront gazebo providing shade when you need to get a break from the sun. You have to take a look at this premier Topsail property for yourself! You can view the photo slideshow for a bird's eye view of all that Topsail Manor has to offer and read the full list of amenities here. Let Access Realty be part of your big day. We'd be honored! Topsail Island is one of the most beautiful places on earth and we'd love to share it with you on your special day. Happy wedding planning! Let us know how we can help.